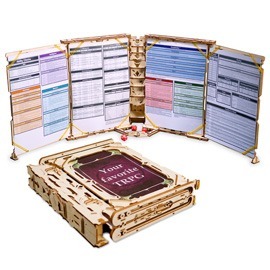 Smart strategists, brave conquerors, wizards and travellers, and all those appreciating a good old card game – rejoice! 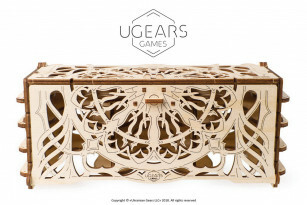 For your next epic adventure is about to begin – now, with the new Card Holder from Ugears Games series designed especially for all board game lovers. The model, designed specially to improve your gaming experience: it will accommodate game cards and help you save space on your gaming table. Whether you are on a medieval fantasy quest or a futuristic space adventure, the Card Holder will be at your service to help you sort your cards, avoid mix-ups, and focus on the game. 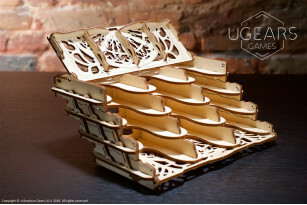 Your new clever device has 12 compartments with spacers that accommodate up to 400 63.5х88 mm cards. 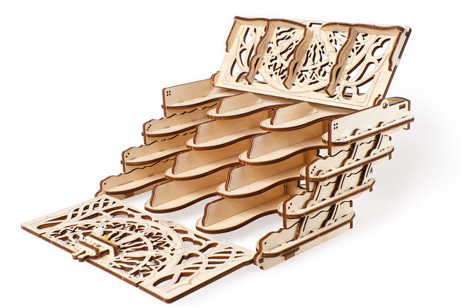 The compartments are big enough to hold the cards in sleeves. 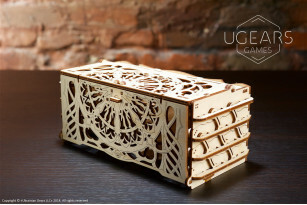 The Card Holder is not merely a pretty box – even though its intricate design with delicate woodwork makes it an outstanding model on its own. It is an exciting device with a smart mechanism inside. 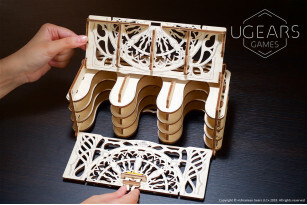 An extending mechanism turns the box into ergonomic staircase shelves that allow you to conveniently pick a card from any stack in your Card Holder. 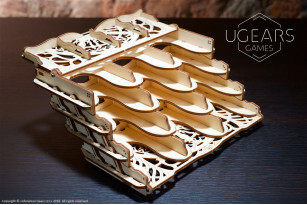 In the extended mode the Card Holder enables four extra slots for cards of 45х68 mm size. 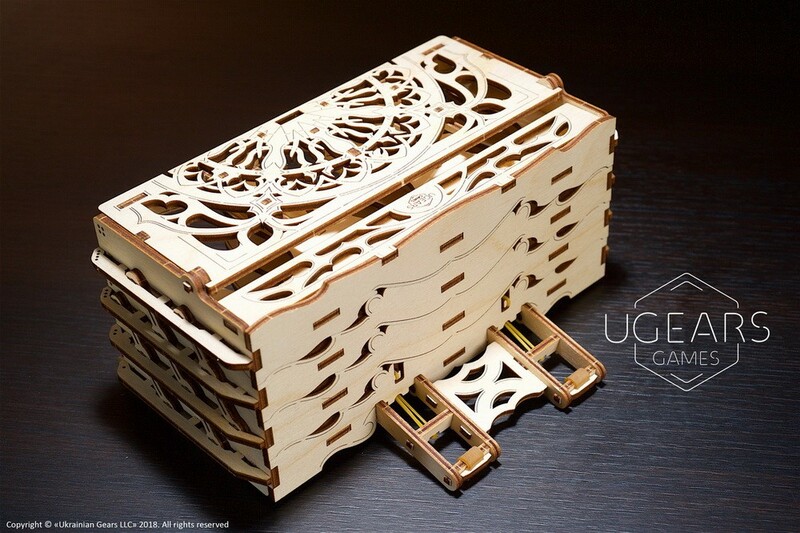 The Card Holder will become your indispensable assistant in a game world as well as a convenient and reliable storage unit for the time in between games: place your cards securely inside the device, lock with a self-contained latch. 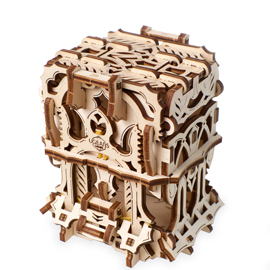 It is now ready to travel in your backpack. 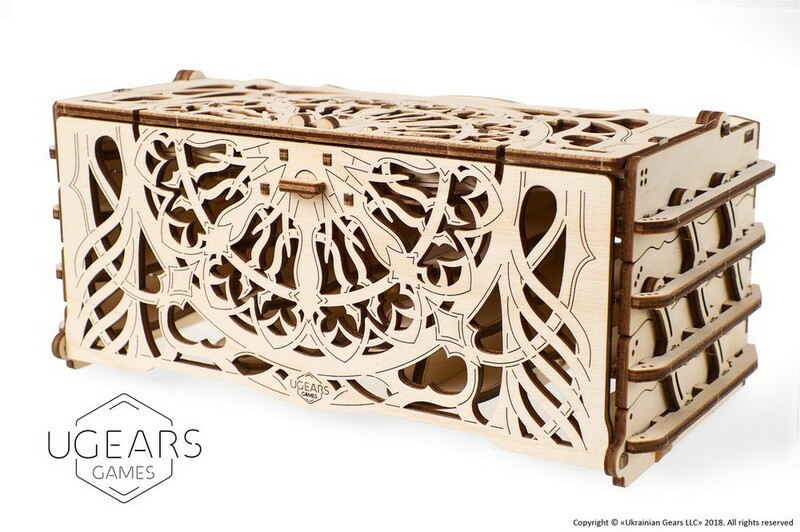 Beautiful patterns of the delicate woodwork guarantees that you will enjoy your useful and attractive model anywhere you take it. 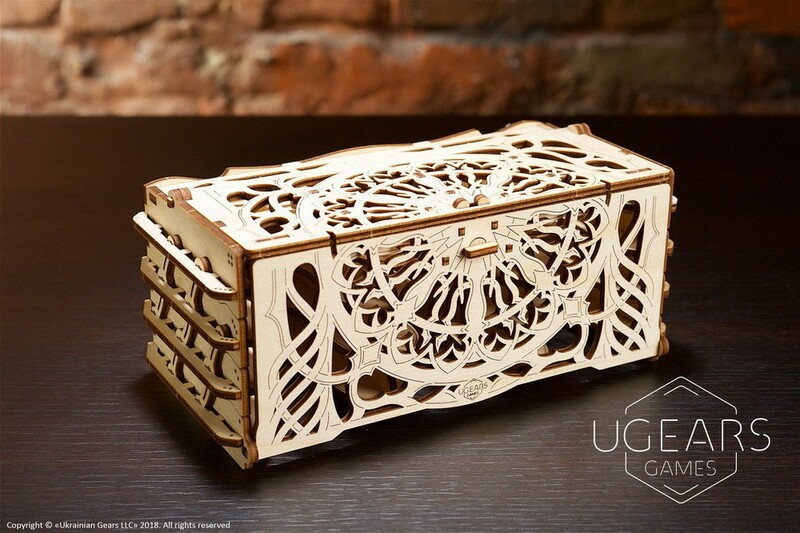 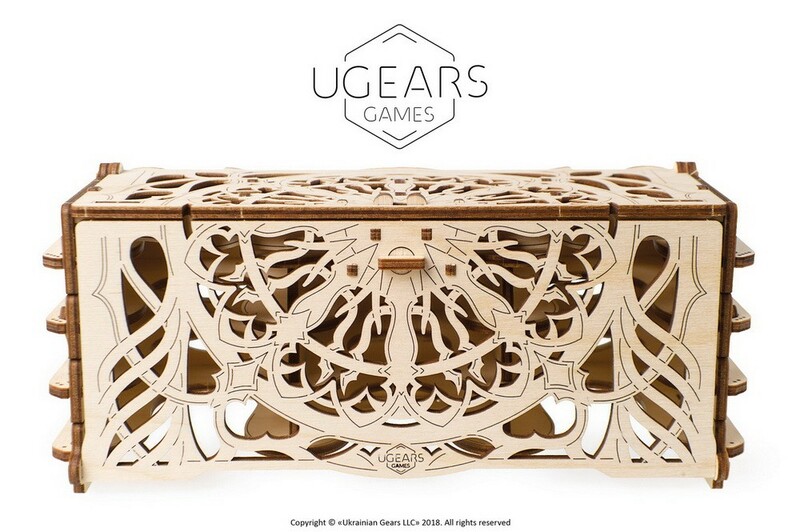 The Card Holder from Ugears will clear your table to ensure the most efficient arrangement of game elements and maximum comfort to the players. 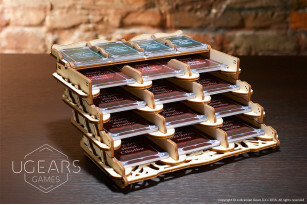 Bring your friends and let the game begin! 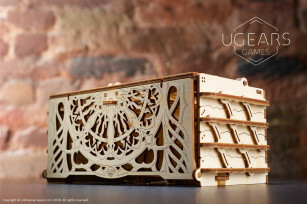 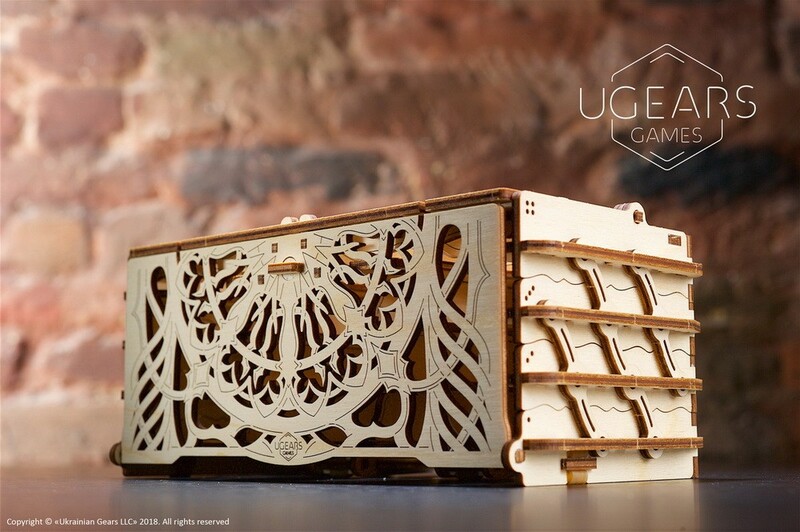 To make your game experience even more complete – also try the Secret model from Ugears Games that we will present a bit later during our Kickstarter Campaign. 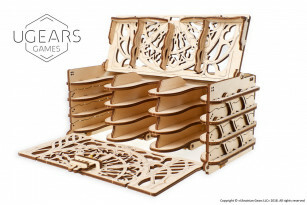 Made from sustainable wooden materials the Card Holder kit has all you need for assembly: a set of high-quality plywood boards with precisely cutout parts, full-color, detailed step by step, truly easy to follow instructions in 11 languages (Ukrainian, English, German, French, Polish, Spanish, Russian, Turkish, Italian, Chinese and Korean) and several spare parts inside. 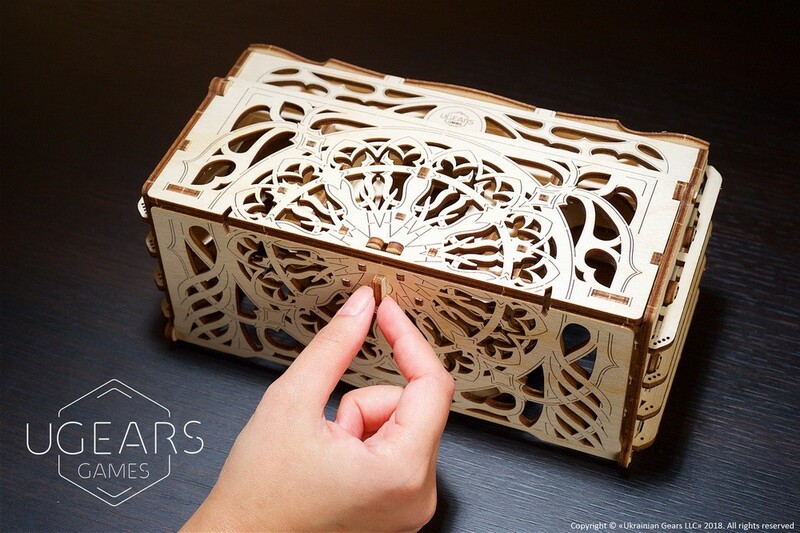 No glue and special tools are needed for putting the Card Holder together. You can assemble it at home on the table. 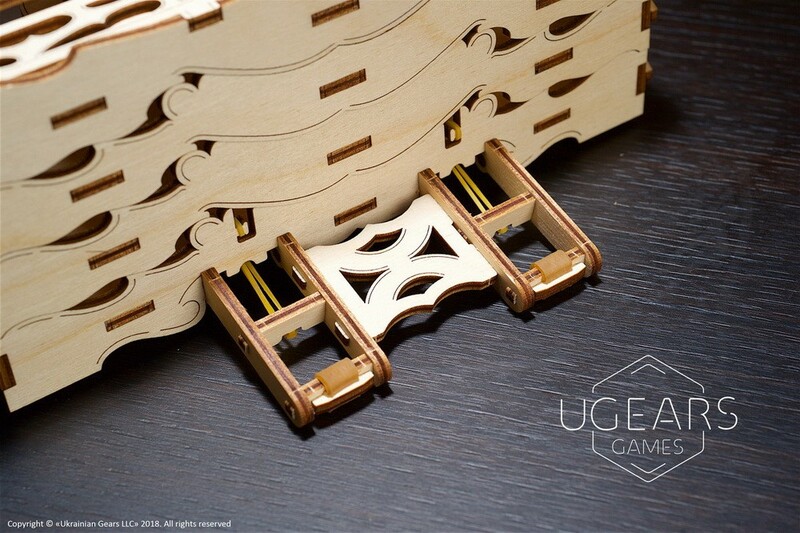 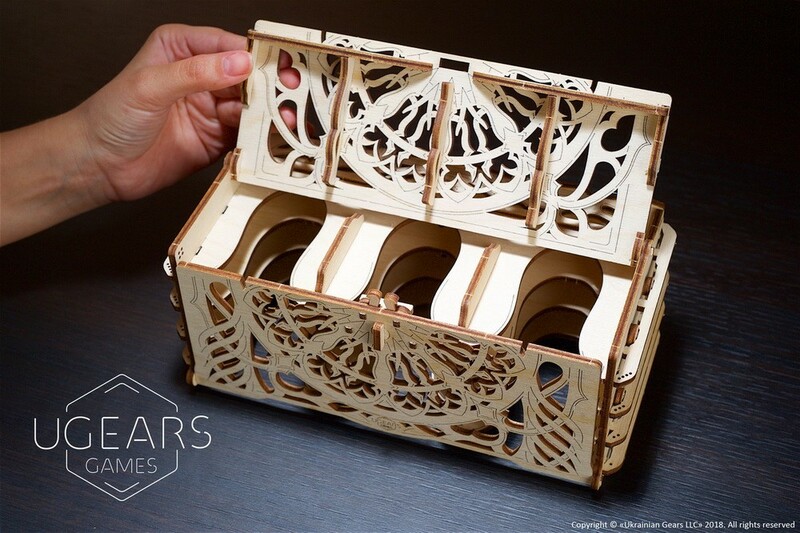 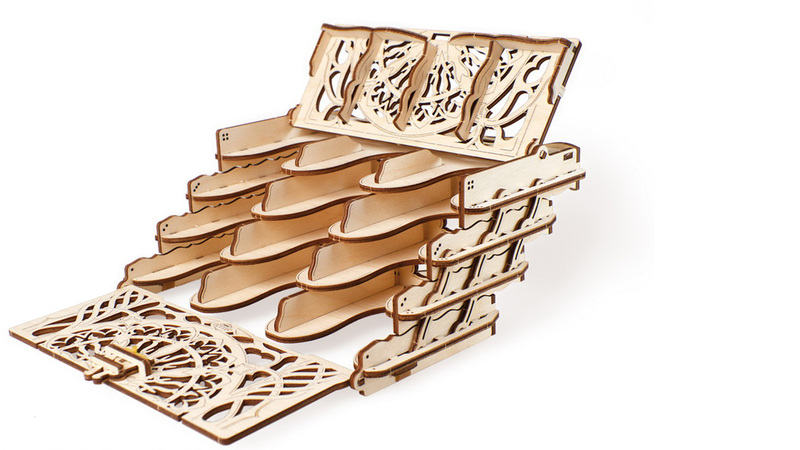 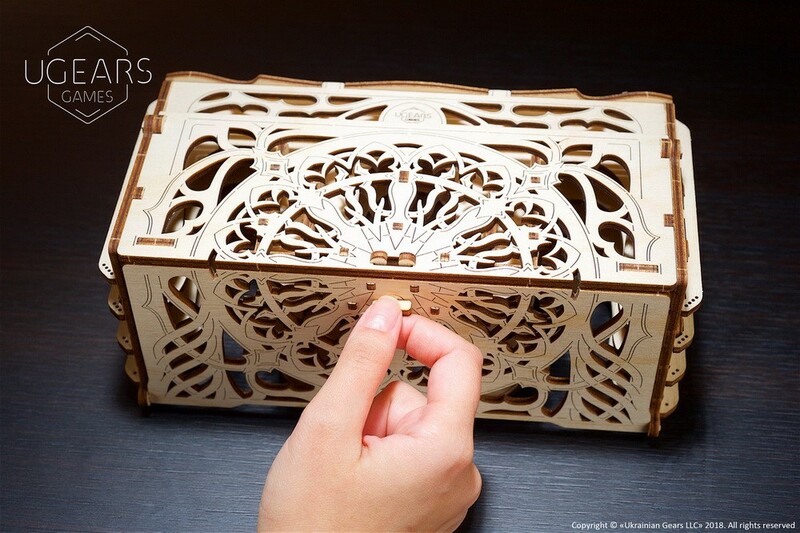 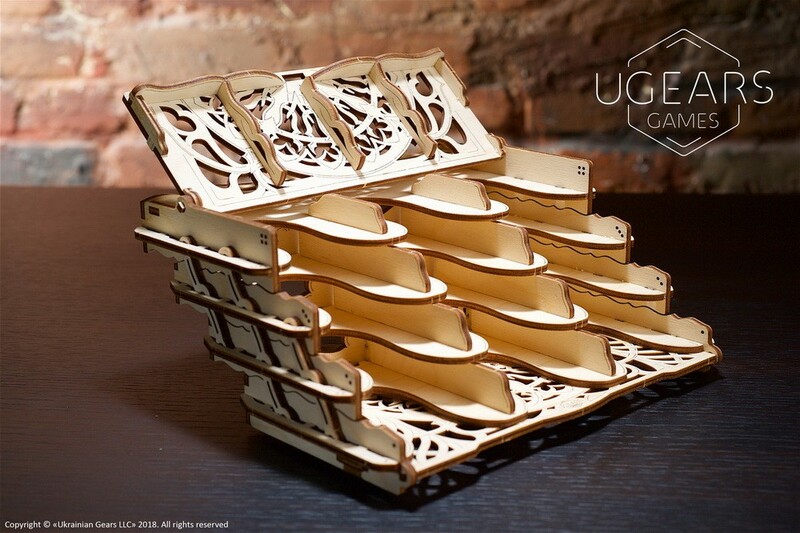 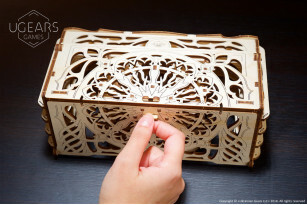 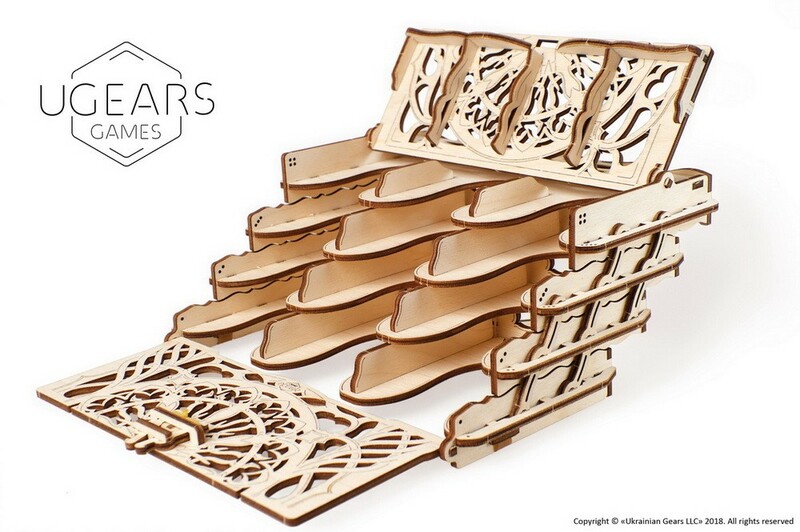 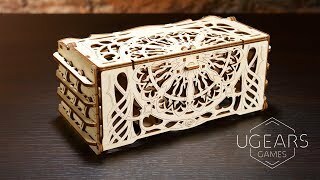 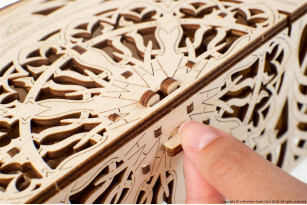 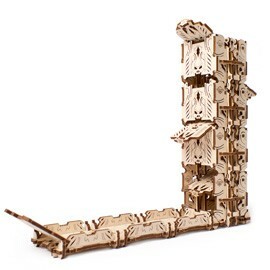 Fits together like a puzzle without glue or special tools or even toothpicks thanks to Ugears’ patented joints.